This has been an ufo for a while now so I decided to finish it up for my April ornament..It is from the JCS Ornament issue from 2005 from one of my favorite designers..Sue Hillis. 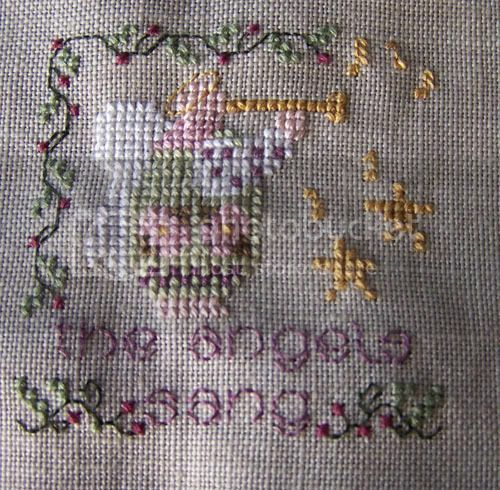 This is from the Just Cross Stitch Ornament Issue 2004. Christmas Ornament 2004 by Periwinkle Promises. 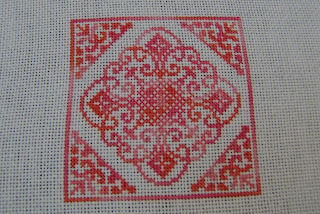 Stitched on 28ct linen that's white with a bit of silver sparkle and cranberry by Gloriana as a thread. Here are my ornies for this month. I completed two, started a third and then decided to switch to a non-ornie ufo instead. 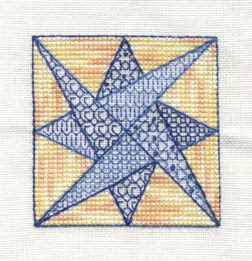 The first is Laced Star by Lynne Herzberg found in the Gift of Stitching December 2006 issue. I have worked on it since the January SAL and I cannot believe I actually finished it. Since I am in stash utilization mode, I used DMC 121 for the blue and DMC 4090 for the yellow. I was not certain that I would like the yellow while I was stitching it, but it actually looks amazing (in a good way) in real life. Very swirly and starburst-ish. DD has already claimed it as hers--since she broke her ornament from 2006 (snapped the poor flamingo's head right off, but then she's four), I'm happy to consider this one her ornament for last Christmas. 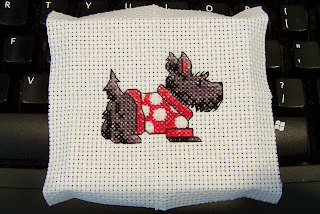 I'm simply amazed that I managed to stitch this little beauty. I nearly gave up on all the black work, then I found a groove and completed it Saturday afternoon. I think it would also look wonderful with the colors reversed: yellow star and blue background. I may stitch it again just so that I can try it out, though it won't be any time soon. I also started the poinsettia by Lynne Herzberg from the same issue of Gift of Stitching, but I needed a break from the blackwork. Maybe that one will be completed in June! 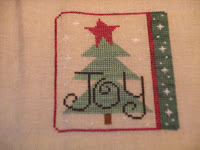 My second completed ornament is a freebie from Lilybet Designs called Joy. It's not on the internet apparently--I received it with a purchase at a LNS, but if you like it you might be able to contact the designer by e-mail to see if she would send it to you. I used 28 count Jade Jazlyn from Picture this Plus. I did not use any of the recommended fibers and just pulled what I had on hand. I used DMC 4210, DMC B5200, Soy Luster Solids #448 Evergreen from the Pure Palette, Six Strand Sweets Spice Drop, and #193 Caribbean Shrimp from Stranded by the Sea. I made my own star using the red DMC instead of finding a red star shaped but as recommended. The scan does not do the design justice of course. It is a pretty little design in real life. I am very excited because I have completed seven ornaments as of now. My baby is due the week before next month's SAL, so even if I can't participate, for a month (or two or three) due to lack of sleep and the constant care of newborn process (I'm looking forward to it actually), I'm still on target to finish twelve ornaments this year! And that would be, let's see, twelve more than I finished last year! I've already picked out the fabric, patterns and fibers for next month though. I'm hoping that I'll manage to do something in April, even if it is only one. I'm so inspired by the stitching and finishing I see here. All the ornaments are truly beautiful. Thanks for starting this blog. Like Margie, I fell in love with Hillside Samplings Topiary Ornaments the minute I saw them. 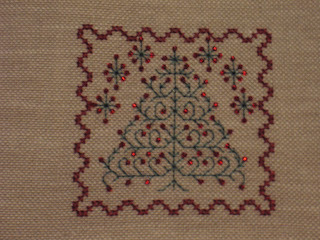 I bought II, III, and IV from a shop in Ohio last summer, but decided to stitch this one (III) because oddly enough our Christmas tree last year was white with purple balls. I think I am going to keep the purple theme through out this year's ornaments. I really loved stitching the border. Repetitive, but with the lovely variegated thread, each stitch was slightly different. I even loved the challenge of the over one 32 count linen of the date. What I did not like was finding out as I was stitching the greenery was that there was not nearly enough variegated green thread to finish. There was supposed to be a 36" length of six strand cotton done with two threads over two. What I got was 18"! It took me the entire 18" to finish the 9 rows I did finish and there are 19 rows in all. I don't think even 36" would have covered it! Thread is cheap. We all have thread left over from kits. Why would anyone try to short you on such a small item? Luckily there is a website with an email address. I wrote a note expressing my disappointment last night and received an answer this morning. Yes, some of the kits were wrong and were distributed before they could be adjusted. They will be glad to send me any missing threads. If any of you have any of these kits, please check them carefully before you start. I'm sorry that I will not be able to finish an ornament this month, but was glad to get such prompt customer service. These are the With My Needle JCS ornament issue designs from 2004-2005-2006. I have three of the five pieces in this series stitched as I still have the 2003 design and the additional design from 2006. 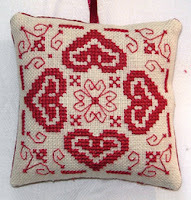 These are a really quick stitch and I'm doing mine on Belfast linen with Threadgatherers Silk n Colors 'In The Reds'. Amazing what you can find if you dig deep enough. 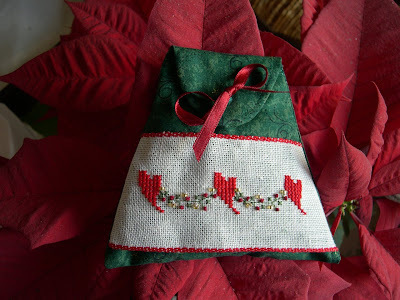 When I saw this littel bag in the book "Advent" from Christiane Dahlbeck, a german designer, I couldn t resist ;-). In the book I found only the grafic for stitching and a foto, therefore the little bag is my "invention". 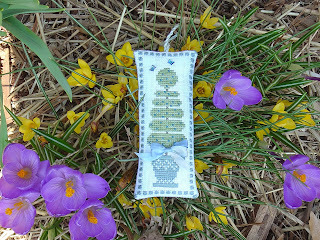 Did I almost mention, that I really love this blog? It is so nice to see all those beautiful ornaments! I'm really enjoying working on these ornies and I'm afraid not much else is being achieved on the stitching front, they're just so quick and stress free compared to the big projects I have going. I was hoping to "finish" as I went, but that hasn't proved possible this month. I guess that gives me time to see all the different finishes here and perhaps do something a little out of the ordinary. I looove this design and am planning to make it just a few more times in different colourways. I've seen this a couple of times so far, it was such a sweet design I had to have one for myself. 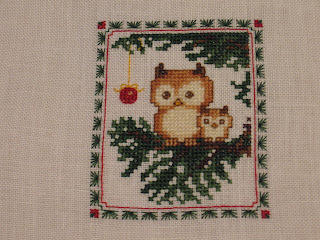 For some reason owls and Christmas seem to go together to me (everyone else thinks I'm nuts but it makes sense to me!). Dani's Last Minute March Ornament! Its been a busy month and I realized yesterday... I hadn't stitched one yet this month! So while I spent part of the morning waiting to get my foot x-rayed (just dislocated my big toe... no break) I stitched up almost half of this and did the rest this evening. As you can see its not much bigger than a loonie! Hi, I'm just joining the SAL and can happily post two finishes for this week and last week and I expect one more by the end of the night. 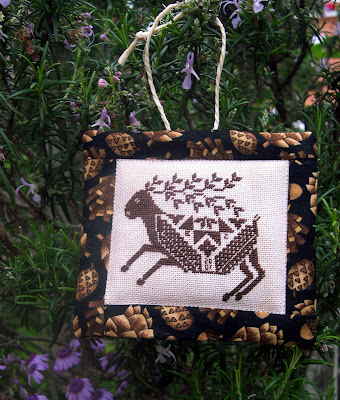 Here is my March ornament - from Hillside Samplings, Topiary 2 using the provided linen and fibers in the kit. This is the second of the four set series I have completed. Next month I plan on stitching #1 or #4 - I can't decide which one I like more. :-) Everyone's ornaments look great! I get so much inspiration from all the finishes. Here is my ornament for the month. The pattern is from Aurelle's site. Everyone's ornaments are so lovely!! This is my March ornament. of The French Country Collection. 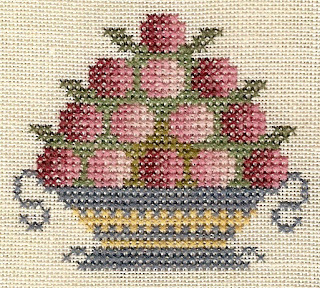 I have used Crescent Colours' Belle Soie Rose of Sharon on a 32ct Belfast linen Expression Elegance by Silkweaver. It was very quick to be stitched, and I have realized it on Friday; yesterday I've quilted it. The back fabric is a Mumm Winter Whimsy Label Panel Multi on Green. 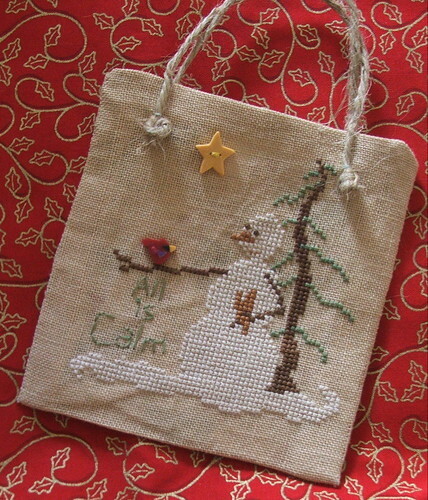 Here is my effort for this month - All is calm (designed by Sam Sarah Design Studio/Just Another Button Company) from the 2003 issue of Just Cross Stitch Christmas Ornamants. It was a pretty quick stitch so I ended up doing the finishing this weekend too. All was not calm this morning as I tried to interpret the finishing instructions and failed repeatedly. So the finishing has been fudged a bit. I'm pretty pleased with how it turned out in the end. I have loved all of the ornaments everyone has made so far this month, they are great!!! I finished the second of 6 ornaments in this set. It was a quick stitch. Very fun. I like the little projects. I got an early start on my ornament this month--this one is actually going to be a two month project, I think. I want to stitch a back for it as well. This was fun to work on. It's amazing how much detail you can get into something that is less than 3 square inches! 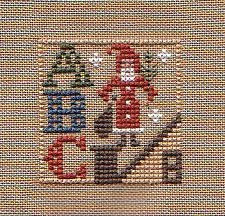 Project: One of the squares from Red Nine, A Mon Ami Pierre. Fabric: 28 count evenweave, not sure what kind. I've been bad. I've been stitching and not posting here and then yesterday found I couldn't, so I want to thank Nicki for the renewed invite she sent me (THANKS NICKI). I am trying to do an ornament a month all year and so far so good. 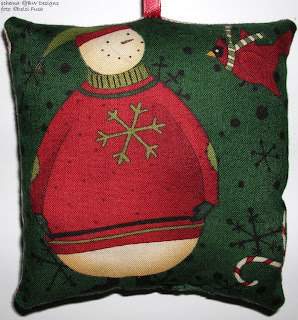 As a non-serious stitcher, I'm inspired by all the talent I see here and with each ornament I see, I find myself saying "I want to stitch that one." 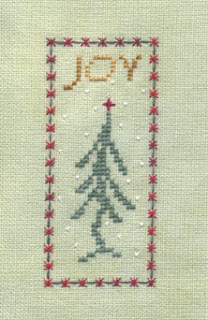 MARCH: Christmas Basket Ornament/Theron Traditions(JCS orn1999). One Anchor thread over two made this a major quickie. 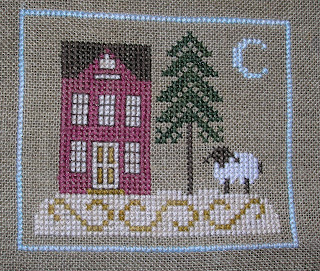 FEBRUARY: Winter's Eve/Country Cottage Needleworks (JCSorn2006) Changes galore and I plan to stitch it two more times, all different. The trim on my own house is raspberry and all my moons are blue because I used to have a website called "Once in a Blue Moon"
JANUARY: Spruce Fob/Heart's Content Kit. I'm not sold on this being an ornament just yet, but we'll see. I joined in Feb but this is the first time I have been able to post my pictures. I did the Lizzie Kate joy ornament. I am hoping to finish them into ornaments this week on my days off. Hi .. 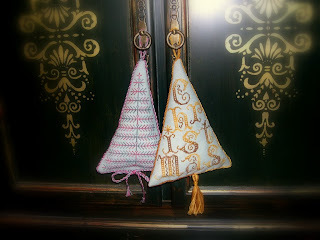 I joined this blog last month but didn't get my February ornament done until last night. 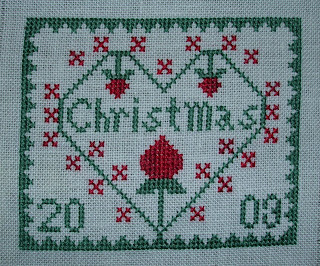 It's from Angel Stitchin' JCS 2006 ornament magazine .. called Christmas Joy. I'm not sure how I'll finish it .. might look really cute as a pillow with the turned down corners? 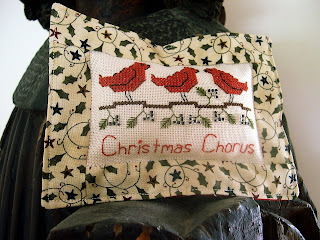 I've really enjoyed this blog and seeing all the wonderful ornaments everyone is stitching .. and the great finishing techniques! 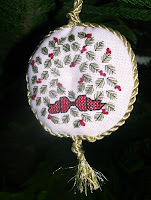 I finished stitching my February ornament. It's a week late because I sliced my index finger open right before the last SAL weekend(Feb. 23). Hi, I'm Deborah from Naples, FL, and I've just joined with you. I'm really trying to get my Christmas Ornaments made month-to-month, and; hopefully, we can encourage eachother to keep them flowing from our fingers until 2008! I love what you've all done. 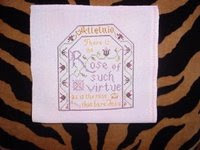 For starters, here's the "Rose of Such Virtue" piece I worked in Feb., to go into a triptych. I'll be starting a second piece from Fancy Works to go with it in March! Looking forward to being a part of your group and getting to know you! Your work inspires me. A week late, but here is my "February" ornament. 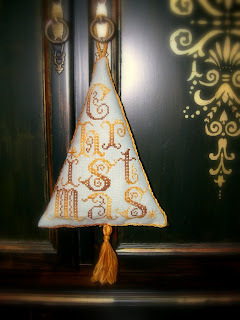 I made the pattern myself (available on my blog). It's stitched with DMC 4030. Everyone's ornaments are just beautiful! Although we are already in March, finally I have finished the ornament of February. Like in January, I have made one of the little trees of The Prairie Schooler. The fabric I used has been also Jobelan 28c and thread DMC 111. I have made the cord and the tassel with the same thread. Also I have finished the other tree that I made on January. Now I will think what can I do for this month. I believe that I will change of style and perhaps I'll make another thing different. 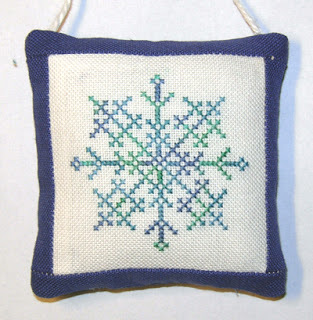 I so fell in love with this Snow ornament from Whispered by the Wind when I saw it posted here last month that I had to stitch it up right away. 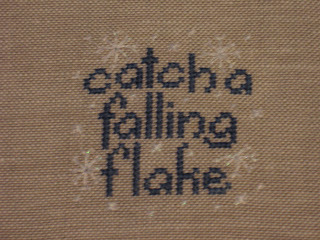 I did it in 3 different versions (see my blog), but I am only going to bore you with this one which is stitched on light blue 14 ct Fiddlers cloth with DMC white. I made one alternation to the pattern to make the word "snow" go in the same direction so that the piece can be turned around. Sorry for the sad photo. I am a bit technologically challenged and do not have the patience to play around with all of the bits to fix it. Last week my children had holidays, we decided, to spent them on the beach. There was a lot of time to stitch and - lucky me - I prepared 3 ornaments. Yesterday evening I made the finish. 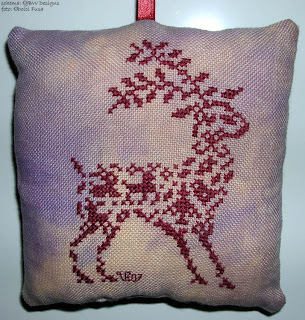 The "christmas chorus" is a little cushion, filled with spices, my favorite ornament is the rendeer, it is stitched in petit point over 1 fabric thread. 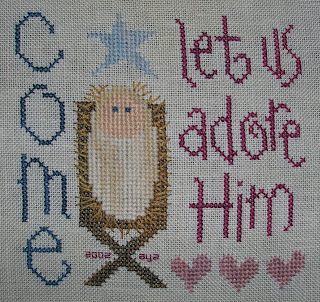 The charts are all from JCS 2006, The Workbasket, Waters Edge and Elizabeths design. Stitched with rests of thread (simply Anchor) and beads on a rest of home colored (with coffee) stitching fabric ;-)). Greetings to everybody, have a nice day!